This pretty theorem details of the construct of triangles using well known I/GCSE circle theorems (Exterior Angle of Triangle and Cyclic Quadrilateral). I like the petal effect in the middle. Never come across the word species in conjunction with triangles before. Geometric Progressions, essential for Core AS mathematicians, appear in Victorian textbook, Synopsis of Elementary Results. In the case where the sum to infinity exists, there is a nice proof by similar triangles. This proof of the irrationality of root 2 uses geometry to gain the contradiction. Arithmetic Progressions, much loved by students of AS Core Mathematic, is an early result in my favourite Victorian textbook and has a good visual proof too. Mechanics can have a reputation for being difficult. When is goes well, however, it can be immensely satisfying and many of my students report that their revision work on maths past papers is much more satisfying and enjoyable the than flogging through the facts in other subjects. Mechanics remains pretty much unchanged by any so called dumbing down of modern exams. The problems of Newtonian dynamics are the same as they were in past centuries and any 1980s A level exam sitter will recognize very much the same subject matter in today’s papers. Philosophically and creatively, mechanics wins hands down as an A level field of study. Philosophically, because there seems to be nothing more noble than the cause of striving to understand the physical work using our human intellect: we observe, we think and then we predict. Creatively, because whilst there is not many tools to learn in this subject there is complete freedom to put them together in countless ways to create fresh ways of looking things. Mechanics is process of understanding a physical situation, distilling its essentials into an idealized mathematical world, processing the mathematics and then interpreting any results. When the stages in this process become blurred, or misunderstood, there is danger for the exam candidate. I am convinced that by following my process, students can learn to write accurate and comprehensive answers to exam questions and gain the best grades. It goes like this. I think that we all know that most of the candidates who trip up in exams do so because they have not read the exam question. The fact that this exact phrase has become a popular and universal metaphor is testament to it’s truth. Understanding the problem is critical. With mechanics there is often a whole paragraph to read! The text is loaded with specific meaning and, most of the time, there is no redundant information. So read carefully and read actively drawing a doodle or cartoon as you go. 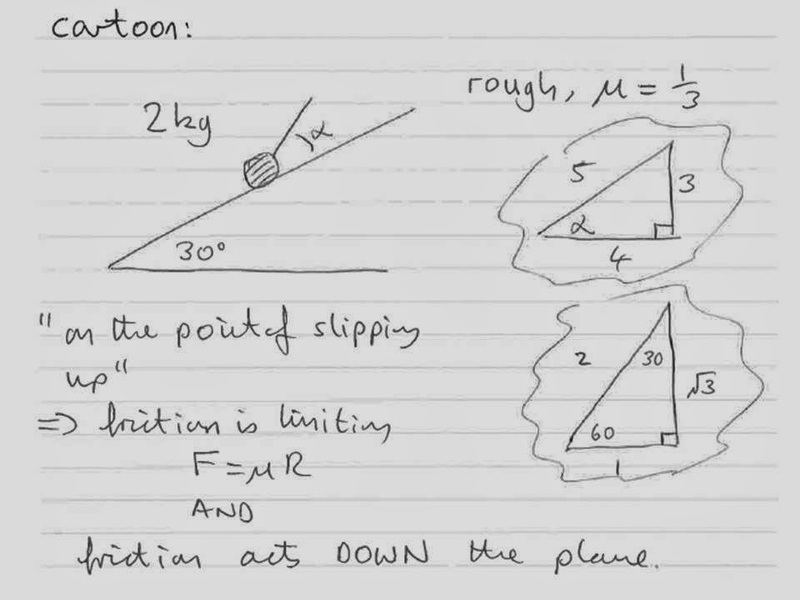 Note down all the relevant constraints on the cartoon as well as any memory dump of formulae or principles; look out for friendly triangles (30-60-90) or any other trigonometric calculation devices. The cartoon is your picture of the real physical world, it is a means of contemplation and, importantly, should not be a mathematical model. This is the crucial step for the natural philosopher and an easy one for the exam candidate. The mathematical model will be one of the ones covered in the module textbook; each module is not particularly broad on its own so there is not a lot of choice. In many cases the model will be a vector diagram of forces or an axis/plane, on which directed motion can happen. In my process it is very important to keep this completely separate from the cartoon above. In the cartoon we were contemplating the real world, in the mathematical model we have moved into an idealized maths world. The two things should be related but they are not the same. The drawing of random force arrows across a good cartoon is confusing and can lead to misapprehensions. Here you resolve forces. Equate components (equilibrium) or apply Newton’s Laws. Often the equations which result will need solution methods of simultaneous equations, quadratic equations or calculus (later modules). Further diagrams may be needed. One source of errors is the drawing of force components on the same diagrams as the original force; candidates should not do this, there is enough space to keep things separate and the review process involved in working out another diagram will settle the candidate and catch any earlier errors or misconceptions. Sometimes a number is all that is required. Normally there are units to be attached too and failure to include them shows a lack of awareness of the context of the problem. Sometimes the mathematical model yields two solutions from a quadratic equation but the context of the problem requires these to be added of subtracted to actually answer the question. The original cartoon needs to be reviewed to check the that the question has actually been answered. There are also important notes of accuracy to be made: express answers to 2 significant figures where g=9.8 m/s^2 has been used. Actively read the exam question drawing a cartoon of the situation and noting down the relevant principles and calculation aids. Work out a clear mathematical model separate to your cartoon, mathematics is very spatial (visual?) so carry on drawing. Interpret your answers carefully by revisiting your cartoon, check that you have actually answered the question and make sure that your answer is consistent in its accuracy and units. Look back at your answer and enjoy its visual impression. IGCSE and GCSE exams are upon us – time to let loose write outs for the most recent papers to help with final revision and checking. Are these getting harder or am I getting thicker?